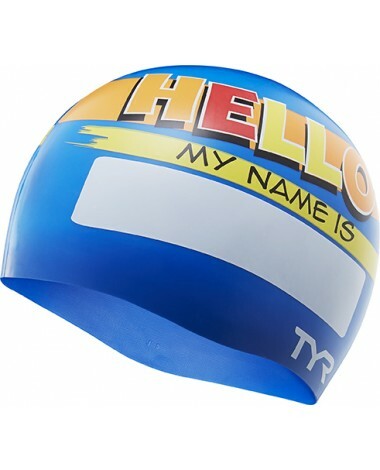 Get fit for fun in the TYR Hello My Name Is Silicone Youth Swim Cap. Durable, kid safe and hypoallergenic, the LCSJRHLO is built with a silicone construction and includes a white space for writing your name. Q: Could this possibly fit an adult? A: Our Junior Swim cap is designed specifically for children, and adults with a smaller head. Get fit for fun in the Hello My Name Is Jr. Swim Cap. 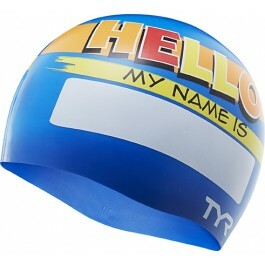 This Swim Cap is built with a Silicone construction and includes a white space for writing your name.